When you watch the behaviour of many different wild animal species over long periods of time, you notice parallels which might not otherwise be seen. Having observed both species in the wild for many years in many different situations, I found a remarkable similarity between the behaviour of a flock of crows and a fleet of three dozen sharks. Though these animals are far apart on the evolutionary tree, it appears that their behaviour was similar because it had a common cause: both sharks and crows were angry. The crows had systematically bullied the five off-spring of the local raven couple while they were maturing, and then the raven youngsters left the area late in the summer. But one of them returned in early winter, and when she did, the crows congregated around her in the trees, and when she alighted on the ground, they descended, prevented her from taking to the air, and pecked her to death with innumerable pecks to the eyes, face, throat, wing joints, the inside of the mouth, and the back of the head. Sprays of blood traced across the snow, and the young raven's face was wet, as if the fluid surrounding the brain was leaking out. The crows' action has many parallels with the behaviour expressed intermittently by the reef sharks I studied in French Polynesia. There was a period in which the responses of the three dozen blackfin sharks who knew me, changed, over a period of three months. Instead of taking the few scraps I brought for them and leaving as they had done for years, they stayed around, and slowly began to bully me in different ways. Finally, there was a session in which their behaviour had become so menacing that I dared not move a muscle, and flew into my kayak like a dolphin when they briefly circled away. When I returned three days later, they attacked the boat. The heavy weight of the loaded kayak with me on it was bashed with shocking force first one way, and then the other, as the sharks slammed it from multiple directions. The surface disappeared―all I could see was sharks emerging at high speed, twisting, bashing into the boat, and flowing together as more replaced those shooting away. Then they came out of the water to snap at the food in the kayak’s well behind me, like the great whites you see in films. I could hear the sound of their jaws snapping shut and one got a good bite of a scrap that overhung the water just a little bit. This behaviour was repeated several times under certain circumstances, and I discussed it in detail in my recent book, The True Nature of Sharks. Yet these two species are very distant from each other on the evolutionary tree, and while crows are generally considered highly intelligent, on a level with humans in some respects, no one would put sharks in that category. However, in these cases, it seems that the key factor was not intelligence, but emotion. Are sharks emotional? Yes, they are. Though humanists imagine that emotions are unique to humans, ethologists recognize the emotions as being the subjective experience of the instincts. Instincts are hard-wired and ensure that the individual behaves as a member of its own species. Then learning allows the individual to adapt to the situation in which it finds itself. The sharks seemed to be experiencing what passes for rage in those animals and it seems possible that the reason for the similarity between the shark and crow attacks is that both were motivated by an anger that was understood and shared by the animals involved. So why were they angry? I speculate that in both cases the emotional state of the animals resulted from a shared conviction that they had been wronged. In the case of the sharks, they seemed to think I had food that I was withholding from them, and over months their convictions were reinforced until their rage broke out in violent behaviour. I would always keep some fish heads in the back of the kayak to feed the nurse sharks who came after sunset. Those huge creatures would lie around on the floor of the site munching them as night gathered. They especially loved to munch the eyes, which released a yummy odour of fat into the scent flow, which continued to attract passing blackfins. Since the most interesting visitors often came late, this was a win-win situation for me and the nurse sharks. The blackfins were not interested in those fish heads because they could not eat them. But they were aware of the scent of them dripping from the drains in the bottom of the well at the back of my hollow plastic kayak. Increasing numbers of sharks had been getting together and going to sniff those drains prior to bullying me, so it appeared that this is was the point they had misunderstood. In the case of the crows, the point is more obscure. I had not been feeding that huge flock and it did not usually come to that part of the valley. But its members have been around for many years, and in 2014, they raided the ravens' nest and destroyed their eggs. It is likely that the ravens have raided crows' nests, too, probably many times. Three mated pairs from that flock of crows nested nearby last year, and they had competed with the young ravens daily. Thus they had known the bird they killed since she had fledged. Crows are known to recognize others as individuals and given the intelligence with which crows are credited, it is likely that the individuals concerned were aware that the young raven was out of her own territory and took an opportunity to get her when she was alone. Possibly the crows' rage was enhanced because I feed the ravens, while they had to be content with leftovers, but conflicts between ravens and crows are known to be the rule where the two species live. Such murders, however, are rarely reported. Ravens, as well as canines (wolves more than dogs) have been shown to hold a sense of justice. (See https://news.nationalgeographic.com/2017/06/ravens-memory-unfair-trade) It is likely, given their intelligence and other capacities, that crows do too. They are in the same family as ravens, the corvids. 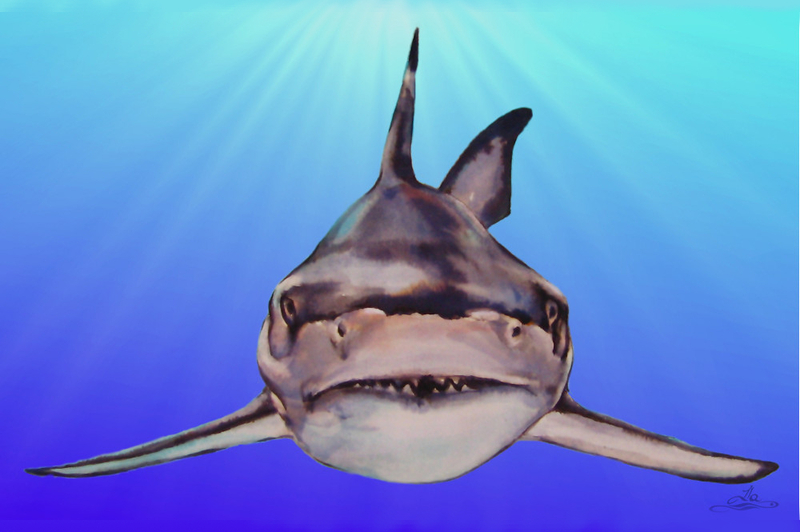 Sharks can outdo dogs on mirror tests, so though it has not been tested in a lab, there is no reason to assume that sharks could not also have an innate sense of being wronged. Animals of many species have been found to appreciate beauty, so why not the essence of justice? Though this is only speculation, no other explanation has arisen for the sharks' behaviour. Two years after the boat attacks reached their height, those sharks were being caught and finned, and during that period, when I came to their lagoon, they would undulate against the kayak as if in affection, and follow me partway home when I left. They have feelings and their feelings had changed. As long as the source and nature of consciousness is unknown to science, there is no basis for refusing it to any living thing.